has registered 20 points in his first 18 games this season in the QMJHL. Kelsey Tessier believes in the adage that surrounding yourself with good people will help you succeed. For the 17-year-old Quebec Remparts center, that axiom is working especially well on the ice. Tessier, a top-rated prospect for next June’s NHL Entry draft, skates on a line between another highly regarded prospect in Mikhail Stefanovich, and Angelo Esposito, a first-round pick of the Pittsburgh Penguins last June. Their team also boasts Maxime Sauve, another draft-eligible prospect, and Tessier likes the attention the group draws from NHL scouts. Tessier also has a hockey legend that he can turn to for additional advice. Hall of Fame goaltender Patrick Roy is the coach, general manager and a co-owner of the Remparts, and brings the same fiery disposition to the bench that he did to the ice as a player during his 19-year career. His will to win sets the tone for the entire team, and Tessier said the players feed off of that passion. Tessier said Roy’s preparation for each game gives the Remparts an advantage, and it’s helped him learn how important attention to detail is in order to be successful. Tessier wasn’t always sure that he was going to ply his trade in the QMJHL. He attended the prestigious Shattuck-St. Mary’s prep school in Minnesota at age 14. He racked up impressive numbers in a season playing alongside another top prospect, David Toews, younger brother of Chicago Blackhawks standout rookie Jonathan Toews. The school boasts famous alumni like Sidney Crosby, Zach Parise, Patrick Eaves and Joe Corvo. 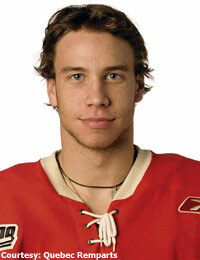 Esposito also attended the school before joining the Remparts. Tessier said his time at Shattuck-St. Mary’s helped him realize that he could have an opportunity to play the game professionally. Tessier played his midget year in Denver, Colo., before joining the Remparts as a QMJHL fourth-round draft pick in 2006. The 5-foot-5, 164-pounder has outstanding offensive instincts and uses his vision and creativity to create offensive chances. But he also thrives on competing everywhere on the ice. Like most draft-eligible players, Tessier feels like he has a lot to work on to get his game ready for the NHL level. He already is quick, but wants to add even more speed to make his game that much more dangerous. Tessier compares his game to that of Daniel Briere. He loves the way that the Philadelphia Flyers’ center competes at both ends of the ice. The two share a common ability to create offensive chances on the ice and the willingness to compete hard for loose pucks. Tessier admits that the pressure of being in his draft year can be intense, but he appreciates having other players around him that are going through the same thing, or have been through it before, like Esposito. He admits that he has set a personal goal of being drafted in the first round and is prepared to work as hard as he can to make that goal happen.